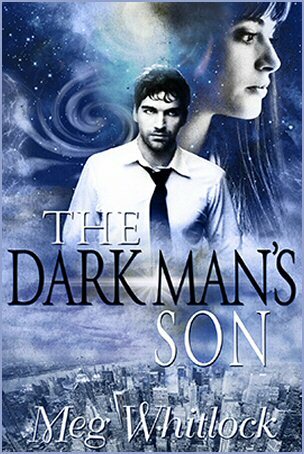 Paranormal Romance and More: Interview & Giveaway with Meg Whitlock, author of The Dark Man’s Son! Interview & Giveaway with Meg Whitlock, author of The Dark Man’s Son! Holly: Hi Meg! Would you tell us a little bit about yourself? Meg Whitlock: Thanks for having me! I work retail as my “day job,” which totally wastes my Art History degree. :) I loved college and had about 10 different majors before I finally picked one. I’m curious about nearly everything, and I love to read, play with my cats, go to the movies, and hang out with my friends. Holly: Can you tell us a little bit about your book The Dark Man’s Son? 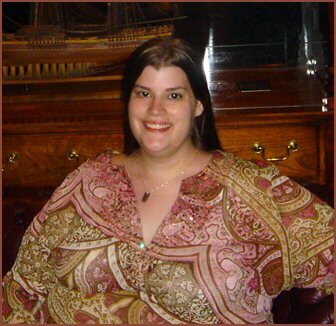 Meg Whitlock: It’s a dark urban fantasy, but a bit different than other books in the genre. The main character is Jason, a regular guy who finds himself caught up in extraordinary events. He meets Alex, who tells him she’s a Guardian—one of two beings created near the beginning of time to fight for mortal-kind’s soul. Meg Whitlock: Characters, absolutely. It took me a while to figure out what to do with them! 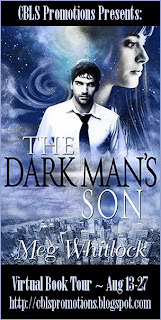 Holly: Where can we purchase The Dark Man’s Son? Meg Whitlock: It’s on Amazon, B&N, iBooks, Smashwords, and Kobo. Meg Whitlock: Hopefully! I’m working on the sequel to The Dark Man’s Son now. Holly: Your life is a romantic comedy; what humors but very embarrassing thing happens on your first date/when you meet the love of your life? Meg Whitlock: We just happen to have the same last name, and he proposes to me so we don’t have to buy new towels. I don’t have monogramed towels, but I just bought new stationary. Ok, that’s sorta dumb. :) But it’s cute in my head! Holly: Is there a genre that you love to read, and would like to write, but just can not? Meg Whitlock: Mystery. I’m good at creating the first bit, the fun suspenseful bit, but I’m terrible at solving the mystery. I end up creating these ridiculous plots that go on forever and ever because I can’t figure out the ending! Meg Whitlock: I just hope everyone who reads the book takes something away from it. It makes them laugh or cry or otherwise feel something. Meg Whitlock: A Storm of Swords by George RR Martin nearly killed me. I threw it across the room, and I’ve never done that with a book before. I did pick it back up and finish reading it and I actually have read it again…but, damn, it kills me!! Meg Whitlock: Before bed, or on one of those long, lazy days. Meg Whitlock: Supernatural. I’ve actually never watched Psych, so it’s a slightly loaded question. :) Supernatural is one of my favorite shows. Meg Whitlock: Coke. Don’t tell me there’s no difference! Meg Whitlock: Either The Hero and the Crown by Robin McKinley or American Gods by Neil Gaiman. Jason Latimer was a logical man. He lived in a concrete world with concrete parameters. The sun rose in the east, set in the west, and in between the two (on either side) demons did not walk. Crazy ninja chicks did not show up with swords (but wait: he must’ve imagined the sword after all, because he hadn’t seen it again after that first shaky glimpse) and wild stories to rescue you from muggers. Muggers, to address that point, did not have strange, distorted faces and voices that sucked all the air from the room. Jason splashed cold water on his face and scrubbed at his cheeks with long-fingered hands. He stared at himself in the bathroom mirror. A stranger stared back at him through familiar midnight blue eyes. Dark stubble dusted his jaw. His nose was badly swollen. He made a note to get his unruly hair cut; when it started to go curly at the back and sides it was time. Deciding he’d put the inevitable off long enough, he grabbed his nose and pushed it back in place with a painful click. He let out a long stream of obscenities as he applied the bandage, and, still cursing, pressed a bag of frozen peas (his grandfather, apparently, believed in being prepared: the freezer had been full of them) against his face. He worked around the bag to pat his skin dry with one of his grandfather’s thick towels. His belly rumbled, but he ignored it: Thai suddenly didn’t sound as appetizing as it had hours ago, before he’d left his grandfather’s ridiculous Baroque nightmare of a brownstone and stumbled out onto the street and into an actual nightmare. That wasn’t fair, Jason thought with a shake of his head. The old man’s place wasn’t that bad. It was just…ornate. And kinda creepy. If there was a single surface free of a grinning gargoyle or an extra, overwrought curlicue, Jason hadn’t been able to find it. Even the towels were over the top. Jason absently rubbed the tattoo on his upper arm as he considered the bedroom he’d claimed for the duration of his stay here. It was the least histrionic of the brownstone’s six, but it was still way too much for Jason’s taste. The master suite had been out of the question: he wasn’t sure how his grandfather had been able to sleep a wink in there. It would’ve given Bram Stoker the willies. He frowned and shook his head again. All these musings on his deceased grandfather’s choice of decor were really just avoidance. The last thing he wanted to think about was the weird mugging and the even weirder woman who’d come to his rescue…a rescue he hadn’t needed, he still stubbornly insisted. With an impatient, oft-repeated gesture, he brushed a lock of black hair off his forehead and tried to clear his mind with a few deep, careful breaths. His swollen nose made it painful. He discarded the peas, centered himself, and began the soothing motions of his nightly Tai Chi routine. He gave it up as no good after only ten minutes. He couldn’t hold the forms; he couldn’t get his breathing right; and his mind simply refused to focus. With a grumbled curse, he stripped out of his workout clothes and tugged on the shorts and t-shirt he wore as pajamas. He grabbed his laptop and the peas off the table and climbed up into the high bed. It was time for some serious Googling, he thought. First things first: what could the vast reaches of the internet tell him about Guardians, and what exactly did they have to do with Jameson O’Connor, his mysterious and recently-deceased grandfather? Meg Whitlock has been writing nearly all her life, and she’s glad she finally got over her laziness and wrote the book she’s been dreaming about for years. She graduated from Queens University of Charlotte with a BA in Comparative Arts with an Art History specialization and an Ancient History minor…which is a mouthful no matter how you say it. She has four cats (including an invisible one), a car named Babar, and a vivid imagination. In 2001 her one-act play, “The Shoebox,” was produced by Catawba College in Salisbury, NC and presented at the American College Theatre Festival. She was honored by Art:21 and the Mint Museum of Art for her essay “Kara Walker: Using Stereotypes to Provoke Thought,” and she’s won awards for both her fiction and non-fiction writing.